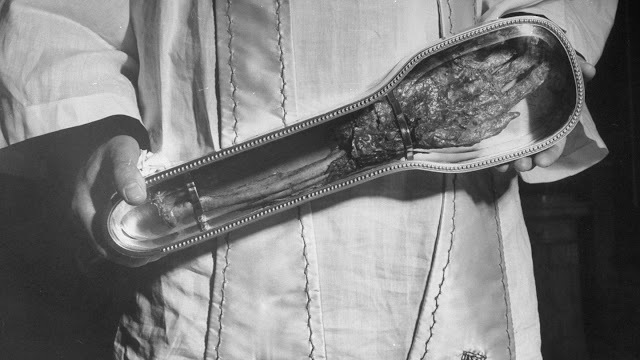 Angèle Regnier, a Catholic woman from Ottawa, is traveling across Canada with a 500-year-old severed arm. To be more specific, it’s the almost 500-year-old detached right forearm of Saint Francis Xavier. Fingers and all. Saint Francis Xavier is one of the more popular saints in Catholicism (he’s not like those other saints; he’s a cool saint). His body is classified as “incorrupt,” which means it hasn’t decomposed like regular flesh. The church says it’s a miracle. “When you can come closer you can see that there is meat on those bones, this is an arm,” said Regnier in a CBC interview. She’s going to be boarding flights across Canada so people in 14 cities can also experience the bony, dead arm. Flying with a dead arm, as goth as it sounds, is a bit of a logistical nightmare. Regnier has to book the arm its own seat on the plane because it’s blessed a bunch of people or something. So it’s too “sacred” for her to toss in the overhead compartment.